Plato’s Closet buys and sells trendy, gently-used teen and adult clothing. The store has designer styles and basic clothing for both boys and girls. The clothes are current styles, clean, and in good condition. Lynn and Dennis Blum founded Plato’s Closet in Columbus, Ohio in 1999. The Blum’s son was inspired by the Greek philosopher Plato, and so the store was named. The Blum family values reusing and recycling, which became the store’s mission. Plato’s Closet currently has around 400 branches in the US and Canada. They buy and sell designer brands at 50 to 70% off, such as Abercrombie & Fitch, Forever 21, American Eagle, Adidas, and Banana Republic. The store employs full-time and part-time roles and offer great employee discounts, competitive pay, and flexible work schedules. Workers receive perks such as 401(k) retirement plans, paid vacation leaves, sick leaves, medical insurance, and employee assistance programs. People like working at Plato’s closet due to the flexible working hours, employee discounts, and conducive work environment. The stores encourage fun and creativity. There are also opportunities for career growth if you want to move up the career ladder. How old do you have to be to work at Plato’s Closet? The minimum age required in retail stores is 16 years of age. Minors can apply as sales associates and customer service representatives. However, supervisory roles or stock work require applicants to be 18 years or older. Plato’s Closet offers various career opportunities for retail, sales, customer service, supervisory, and management positions. If you enjoy working with fashion, alongside energetic, team-oriented, fun, and creative people, then this is for you. Plato’s Closet belongs to the Winmark umbrella, along with the corporate family of Once Upon a Child, Style Encore, and Music Go Round. This means more opportunities for jobs and career growth. Customer Service Representative: A customer service representative is responsible for assisting the management in promoting the products and services. Other responsibilities may include pricing, purchasing, selling, merchandising, loss prevention, supervising staff, and training. You are also expected to be knowledgeable about the products and prices to be able to assist the customers with their concerns. Cashier: A cashier assists the management in operations and may include tasks such as pricing, purchasing, selling, and merchandising. You must be able to handle all transactions is a timely, professional, and enthusiastic manner. You are also expected to be familiar with the store’s merchandise and recommend products as needed. Sales Associates/ Buyer: A sales associate should be service oriented and eager to work with teens and retail. You are expected to buy and sell teen’s clothing and accessories with exceptional customer service. Other tasks include stocking, organizing, inventory tagging, and maintaining the store. You are expected to apply your knowledge in teen’s products and buy items to promote in the store. Retail Sales Associate: As a retail sales associate you are expected to help achieve the store’s goals by providing exceptional customer service. Among the responsibilities are inventory management and promotion, maintaining knowledge about products, brands, and pricing. You must be knowledgeable about teen and adult fashion trends, and must be upbeat and energetic when dealing with customers. Backstock: As a backstock associate, you work behind the scenes and are responsible for sorting, organizing, restocking, and maintaining the over-all store’s appearance. You should ensure that the merchandise is moved to the store quickly and efficiently. Other tasks are being responsible for ticketing the items based on buying and pricing guidelines, maintaining the store displays, and ensuring the store’s cleanliness. Shift Leader/ Manager: A shift leader or manager is responsible for managing and promoting the business. Your tasks include training and supervising staff, buying, pricing, selling, merchandising, and loss prevention. Your role is to lead in assigned shifts, ensure that customers are greeted properly, and are assisted in a timely, professional, and enthusiastic manner. Inventory Manager: An inventory manager is responsible for the store’s profits by receiving, handling, and assisting in the inventory management of supplies and merchandise. You are also expected to maintain the visual standards of the store by ensuring that the displays and stocks are well-organized. You are also required to keep track of all inventory in an accurate and timely manner. Assistant Manager: An assistant manager works with the store manager in the continuous improvement and promotion of a store. You are expected to manage operations workflow, help increase sales and profitability with sales strategies, promote collaboration within the staff, and maintain timely and accurate financial records. You are also in-charge of maintaining store operations and merchandise. Store Manager: The store manager is fully responsible for the performance and operation of a store. You should lead by example and help drive sales by demonstrating exceptional customer service. Among your other responsibilities are controlling the expenses and payroll, ensuring proper merchandising, interviewing prospective associates, and maintain over-all records-keeping. Shift Manager: A shift manager leads assigned shifts and is in-charge of opening and closing responsibilities. The shift manager ensures that the customers are greeted properly, assisted in a timely and professional manner, and that all their needs are addressed. You are also expected to be knowledgeable of products, brands, and prices and recommend products to customers. If you are interested to apply in Plato’s Closet, download the form on the website and submit it to the nearest retail store in your area. There are part-time and full-time positions depending on your qualifications. As an applicant, you should demonstrate an interest and knowledge of fashion. You should also be energetic and highly personable as you will be dealing with customers who are mostly teens. An enjoyment of fashion and being able to connect naturally with the general public will give you an edge. Once you have downloaded the application form, make sure you print it out clearly and legibly. You are also required to submit hiring documents personally, so make sure you have them prepared. You may be invited for an interview as soon as you submit the application if a manager is available. If you are not interviewed right away, make sure to get the email or contact number of the hiring manager so you can follow up on your application. Allow up to two weeks to hear back from them. Otherwise, you can simply give them a call and ask about the status of your application. Plato’s Closet buys and sells gently-used trendy fashion and caters to those who are looking for cheap and fashionable items. The clientele are mostly teens. The sales and associates are energetic, fashionable, and always willing to lend you a hand. If you have gently-used clothing, just make sure they are clean and wearable once you bring them to the store. Our friendly staff will review your items as you browse through the merchandise. Our offers are based on brand, style, and condition. Once you accept, you can either sell or trade. 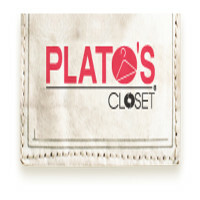 Plato’s Closet is known for current and fashionable clothing for both boys and girls. The store promotes recycling and reusing by encouraging others to sell or trade their gently-used clothing. You can bring in your accessories, outerwear, footwear, and athletic wear. You can also become one of our franchisees and join the Plato’s Closet network. Plato’s Closet has been ranked as the number one teen resale franchise by the Entrepreneur magazine. Visit the website and learn how you can become a business partner and entrepreneur. 1 How old do you have to be to work at Plato’s Closet?